In the early 1800′s settlers began to make their way to the area increasing the trade and growth of the Spring area. Colonization began to flourish after Texas won it’s independence from Mexico in 1836 which was the same year Houston was founded on the Banks of Buffalo Bayou. For the next nine years settlers migrated steadily to the area as part of the “Republic of Texas”. In 1845, Texas became part of the US and generous land grants were relatively inexpensive to obtain for homestead farming which stimulated more growth to the area primarily by German Settlers. 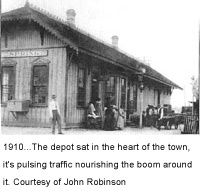 After the Civil War, railroads expanded into South Texas. In the 1870′s, railroad tracks were constructed to Houston and rapid industrialization began for the Houston area. 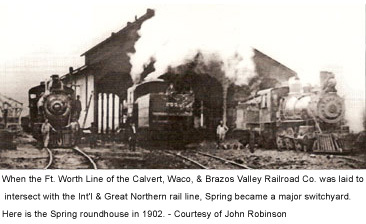 Spring was named by railroad workers that were laying the tracks to the south during a harsh winter, when they reached the area it was spring time and they were so excited about winter ending they named it “Camp Spring”. In 1873, Camp Spring was platted by the I. & G.N. Railroad and became a settlement. “Camp” was dropped from the name and Spring became the base of operation for railroad workers. This addition stimulated abundant growth for lumber companies and farmers and created jobs and opportunites for new immigrants to the area. 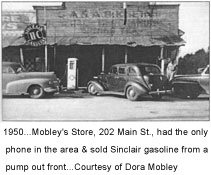 the Depression of the 30′s, Spring was reduced to a small settlement and remained dormant until the late 60′s when local merchants started locating around the Spring Cafe’ (Wunsche Bros.) to take advantage of the economic growth enjoyed by the oil boom in Houston. Old Town Spring emerged with the steady growth of merchants through the 70′s and 80′s into a favorite site of customers and visitors from all over the world and produces several popular festivals and events such as the Texas Crawfish & Music Festival held each year in April. Old Town Spring is voted one of the top attractions in Texas each year. Be sure & visit the Spring Historical Museum & pick up “Spring, Through the Seasons, Stories of a Texas Town” by Margaret Mallott Smith. Generally pharmacy can offer to you with genuine treatments for many health problems. What are the main things that patients think when they are going to buy some medicaments? If you’re concerned about erectile health problem, you have to learn about levitra vs viagra vs cialis. Of course, there are many matters you have to think about it. Cialis is one of the best-known medications of all time. What do you already know about difference between viagra cialis levitra? This recomendation is mere, but it can make all the difference if you need info about cheap cialis online canadian pharmacy. A medicinal research found that about 14 percent of men taking Zyban reported sexual soundness problems. There are side effects possible with any type of medication. More info available at viagra cialis levitra which is best.